We are off to celebrate our wedding anniversary today! I can't tell you how much I love these special days... any reason to celebrate and do fun things is a winner in my book! I hope you all have a lovely weekend! I'll be posting ornaments next week instead of this weekend, but I'll have more information on that soon. For now, just have a really great day! P.P.S. The Urban Legend giveaway winner is Mandy from Hello, Dear Wind! Congrats! Your dress has the prettiest collar! 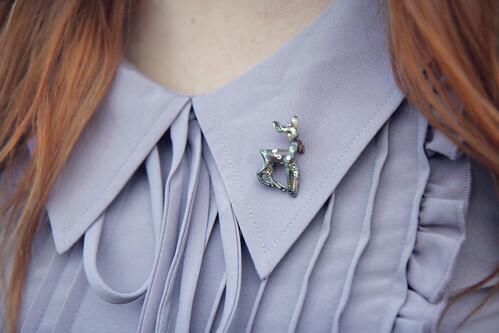 <3 And I love the darling fawn brooch! i love those shoes! 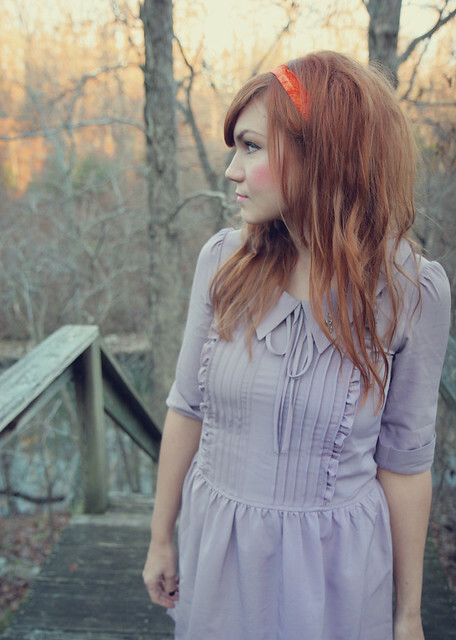 the whole outfit ties together so nicely and goes lovely with your hair. I love that ruffly dress! So pretty and a very happy Wedding Anniversary!!! Adorable dress, such a pretty colour too. you're beautiful! i love the detail on the collar! This dress is so pretty. You look beautiful in it. You look lovely! Have lots of fun and relaxation during your getaway. Can't wait to see this year's ornaments! This dress is so pretty, i thinkit has to go on my christmas wish list! I love that little pin on your dress! So cute! oh how happy i was when i saw a 2nd weekly wears post!! love this dress... one of the cutest ever!! I love your dress and your shoes are just darling!!! Oh those colors, so pretty! I love how you combine the colors! Congrats on your first wedding anniversary! This weekend my boyfriend and I are celebrating our first year together! Happy anniversary! 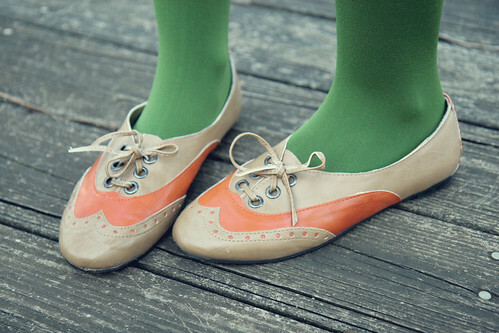 I love these colors together and those shoes- what a great find! I love your hairband! What is it and wear did it come from?!!! 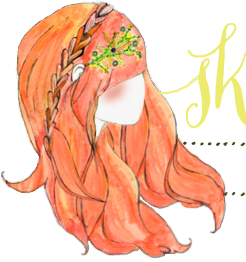 Looks like autumn leaves :') It looks great with your hair too! That dress is amazing! I love it so much! I love your makeup in these photos as well. It's almost doll-like. Happy anniversary, and your outfit is the cutest! wow... this outfit is so perfect, and you found the shoes at marshalls?? excellent find!! This dress is adorable! And with your hair color - the color pop is so pretty! I just ran across your blog the other day and I am completely sucked in. You have an amazing sense of style and I love your choice of color combinations in your outfits. Thank you so much for being such an inspiration! You're so cute I can't even stand it! I just wanna hug you. I love the color combination of this outfit, your pin and your shoes. Dorbs! What an absolutely adorable outfit! 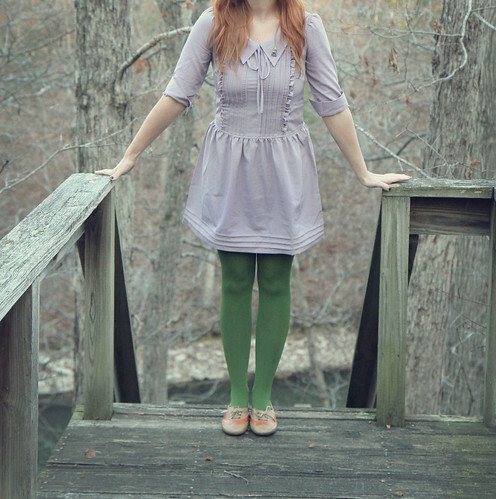 I'd so wear that dress, and I just love colorful tights! Happy Anniversary and many congrats to you! My 18th is coming up very soon - yay for wintry weddings! Oh, I love the color combination of green and lavender! Looks awesome with your red hair! that dress and those shoes... so pretty! That brooch is the one of the cutest things ever! This is a gorgeous, simple look. Love it! Oh goodness you are adorable. Happy anniversary!